Entries from Digital Intelligence tagged with "finland"
Shares of Rovio, the Finnish company made a solid debut on the Helsinki stock exchange last week. A 10-year-old hacker has been awarded thousands of dollars for breaking into Instagram – a service he’s too young even to use. Rapper Vanilla Ice has been hired to celebrate the joys of vanilla ice cream as part of a video-led campaign to raise awareness of online casino brand Casumo in Finland. Rovio has launched Angry Birds 2, the follow up to the hugely successful mobile game. But the Finnish firm is under-fire for a new in-app purchases system. Home to Angry Birds and Nokia, online advertising is booming in Finland, overtaking TV ad spend for the first time this year. Rovio is laying off 16% of its workforce as the Angry bird maker focuses on its games, media and consumer products businesses amid stalling growth. Rovio, the Finnish game maker behind Angry Birds, saw revenues rise just 2.5% as profit growth fell by half, according to its latest financial post. Angry Birds maker Rovio has got into the education market with a new educational product aimed at teaching kids physics based on the popular mobile game. This chart shows the reach of sports sites across Europe's online population.The top three sports sites accessed during the period are Yahoo! Sports, Goal Sites and Eurosport. 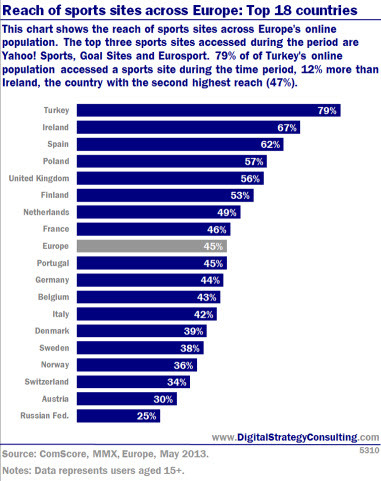 79% of Turkey's online population accessed a sports site during the time period, 12% more than Ireland, the country with the second highest reach (47%). In Europe, the computer is no longer the only access point for digital content. New data from comScore indicates that the UK, Ireland and Russia lead Europe for mobile traffic. Rovio Mobile has launched Angry Birds Friends for Apple and Android devices, letting players of the popular mobile game compete against Facebook friends. 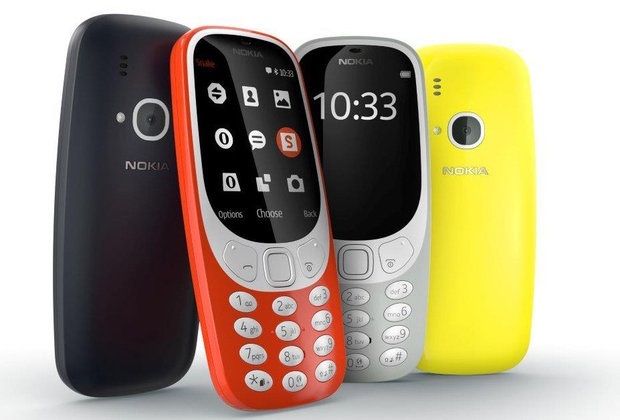 Nokia has launched a feature phone with a dedicated WhatsApp physical button, offering users a cross platform messaging tool as a free wi-fi-based alternative to texts. Rovio has posted sales of €152m, more than double its revenue for 2011, as the Angry Birds reator continues its success as one of the world’s biggest mobile games makers. Sweden tops the list of most savvy web users in the world, with the US and UK following behind, according to a new survey launched by Internet inventor Sir Tim Berners-Lee charity foundation. The study, compiled by Sir Tim Berners-Lee's World Wide Web Foundation, ranked both the social and political impact of the web. Angry Birds maker Rovio has bought Futuremark Games Studio for an undisclosed sum. Futuremark Games Studio, formed in January 2008 and also based in Finland, is known for games such as Unstoppable Gorg, Hungribles, and Shattered Horizon. 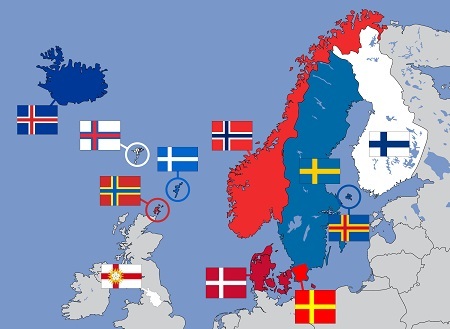 The Netherlands and France have the highest penetration of online banking users in Europe, followed by Sweden, the UK and Finland, according to new research. The study, from comScore, looked at internet usage in Europe, showing 381.5 million unique visitors went online in December 2011 for an average of 27.5 hours per person.